What is Scripts FloraZil + Multi-Probiotic Food Spray for Dogs? Scripts FloraZil + Multi-Probiotic Food Spray for Dogs is an easy-to-use probiotic spray to promote healthy digestion in dogs. Designed to be sprayed directly on either wet or dry dog food, Scripts FloraZil + Multi-Probiotic Food Spray for Dogs provides multiple sources of viable microorganisms to support digestive function. This wide spectrum of probiotics helps to populate the GI tract with good bacteria while keeping bad bacteria under control. Proper bacterial balance in the digestive system helps to promote regular bowel function and overall good health. Spraying your dog's food with Scripts FloraZil + Multi-Probiotic Food Spray for Dogs enhances flavor while adding to the nutritive value. 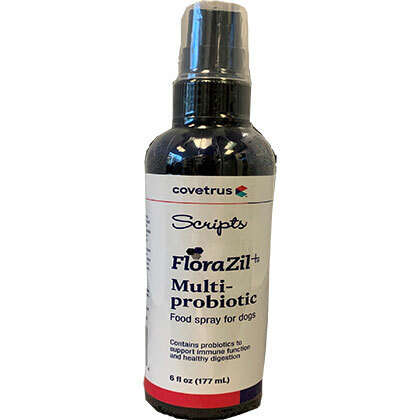 Scripts FloraZil + Multi-Probiotic Food Spray for Dogs contains viable probiotics to promote healthy digestion in dogs. Probiotics are viable microorganisms that populate the GI tract in an active state and are beneficial to your dog. Probiotics play an important role in the function of the GI system and help support your dog's overall health. Spray Scripts FloraZil + Multi-Probiotic Food Spray directly on your dog's wet or dry food. Adjust the number of sprays by the size of your dog according to the chart below. The live and active bacteria may cause the spray pump to clog. Simply take the pump out of the bottle, rinse the pump with water and reinsert. Ingredients: Water, liquid Lactobacillus plantarum fermentation product, liquid Enterococcus thermophilus fermentation product, liquid Lactobacillus casei fermentation product, liquid Bifidobacterium bifidum fermentation product, liquid Bifidobacterium animalis fermentation product, Liquid Bacillus subtilis fermentation product, liquid Lactobacillus bulgaricus fermentation product, liquid Bifidobacterium longum fermentation product, active dry yeast, cane molasses, salt, natural flavor.